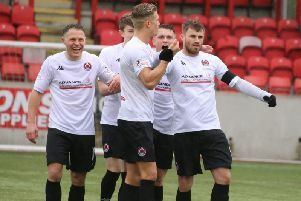 Clyde had to make do with just a point as they failed to break down a stubborn Edinburgh City side in a stalemate at Broadwood. The game bore many similarities to the last meeting between the sides which was settled with a solitary goal. This time the visitors set up to frustrate by playing with five at the back and hitting Barry Ferguson’s men on the break. And it nearly paid off after just 12 minutes- Christopher McKee’s long throw finding Ryan Porteous in space but his free header was poor and easily saved. The Bully Wee’s first real opportunity came on the half hour mark as Scott Linton’s corner bounced around the box before coming to Scott Ferguson. The youngster’s toe poke did evade the defence- but it also evaded the goal as it rolled past the post. Minutes later and Clyde had another good chance to take the lead with Scott Linton once again involved. His threaded ball picked out Peter MacDonald in a good position but the striker’s effort was weak as it was hit straight at the keeper’s near post. The visitors were unlucky not to score on 37 minutes, with Dean Cummings’ corner kick finding Ousman See who controlled it well before wasting the chance by ballooning the ball well over John Gibson’s crossbar. The second half was comparable to the first in that the majority of chances came Clyde’s way- with Edinburgh rarely posing a threat in front of goal. In the 59th minute Ewan McNeil whipped in a low fizzing ball from the right hand side that was picked up by Sean Higgins before he side footed it just wide. Scott Linton created a good opportunity in the 74th minute as his crossed ball looked to be heading towards Phil Johnston but the substitute couldn’t get onto the end of it. The most noteworthy moment of the match came on 78 minutes as Peter MacDonald’s effort went into the back of the net but he was judged to be in an offside position- a decision which was later deemed to be incorrect.